Hey @washingtonpost – are you really implying that the words "Jewish state" means a "Jewish-ONLY" state? Because that is not only false but libelous. The story now describes Tlaib as "a Palestinian American who is critical of the Israeli government’s treatment of the Palestinians." 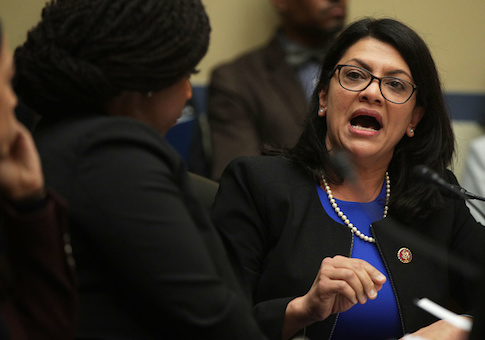 A correction was added at the bottom: "An earlier version of this story did not make Rep. Rashida Tlaib’s position on Israel clear. The story has been updated to explain that she is critical of the Israeli government’s treatment of the Palestinians." Omar was forced by Democratic leadership to apologize last month after saying it was "all about the Benjamins" for pro-Israel politicians and claimed they were paid off by the lobbying group AIPAC. When she suggested that supporting Israel was tantamount to "allegiance to a foreign country," some of her Democratic colleagues balked again and called for her to be rebuked in a resolution. However, far-left members of the party rallied around her, leading to tensions in Speaker Nancy Pelosi's (D., Calif.) caucus. They eventually passed a resolution condemning all forms of hate, leading to criticism and even some "no" votes from Republicans for watering it down. This entry was posted in Politics and tagged Anti-Semitism, Ilhan Omar, Israel, Rashida Tlaib, Washington Post. Bookmark the permalink.